Update: The arrested was released in the night of April 9. See the below. Bottom: Fr. 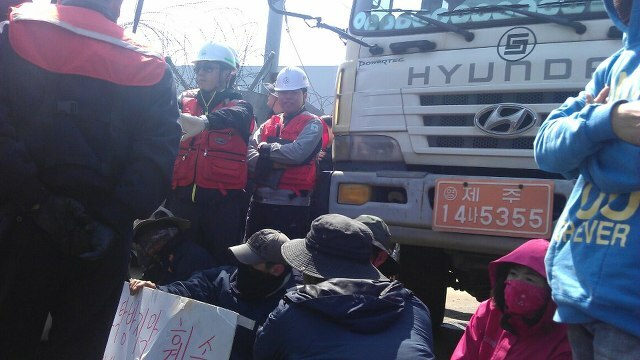 Mun Jeong-Hyeon, mayor Kang Dong-Kyun and people blocking the trucks. For more photos, see here. 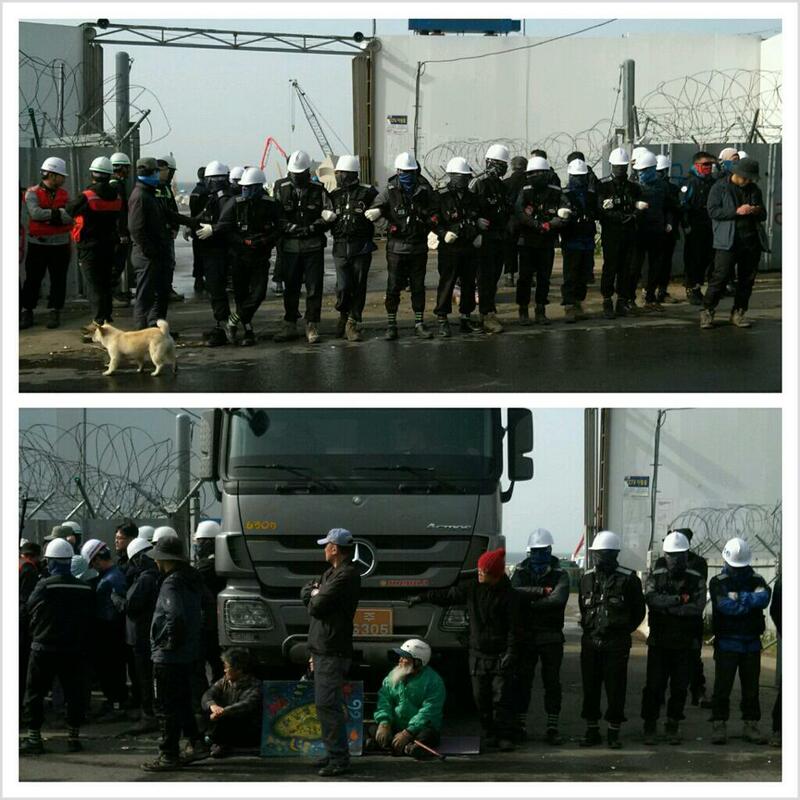 Photo by Yange Gone on on April 8/ People blocking construction trucks. 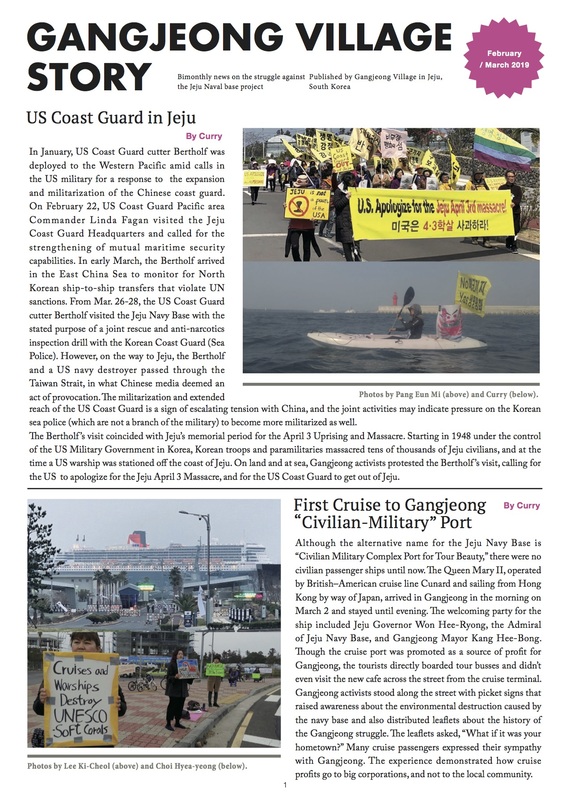 Gangjeong has been in emergency from the early morning of April 8. 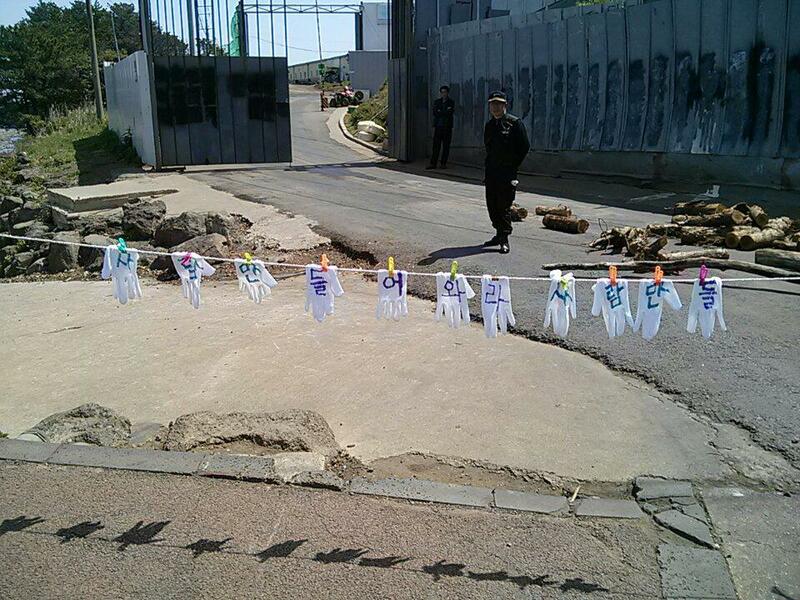 While company workers block the gates, police are intentionally silent on it. People are desperately keeping the gate. Company workers’ violence to people is very high possibilities. One young man was hit in eye glass and needed medical investigation in face on April 8. One person was arrested on the same day. Village siren rang on April 9 following April 8. ‘The navy has enforced construction in violation of the project approval conditions, such as dumping sands and stones on the sea even before the silt-protectors that have been damaged by strong rain and wind last weekend are restored. Further, large amount of earth and sands have been leaked into the sea due to the rainy weather last weekend, resulting in mud water, while the people’s criticism on the navy’s illegal construction has been bigger. For more photos of protests, see here. As mentioned, illegal construction enforced with broken silt-protectors and dumped unwashed sands & stones on the sea was continued. 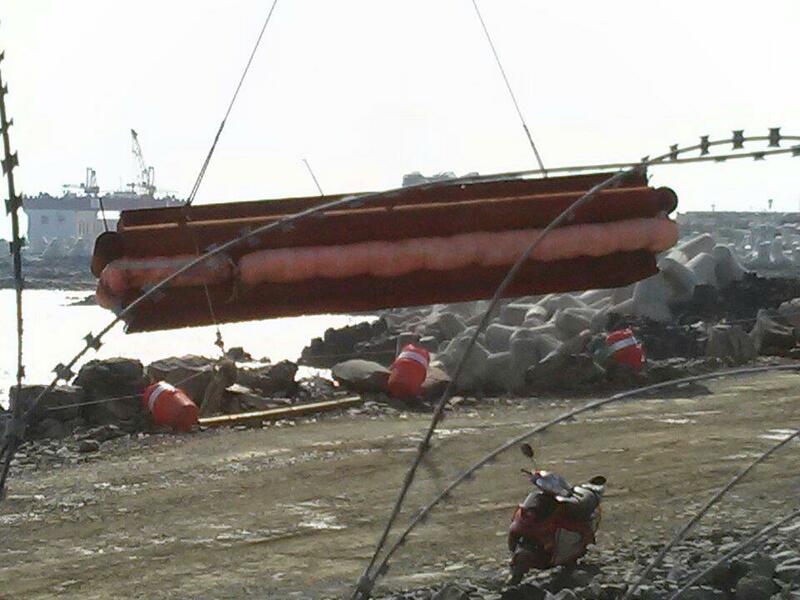 ‘It appeared that the sea area of the Beomseom (Tiger Island) designated as the government natural memorial is largely being threatened as big amount of mud water was leaked from the Jeju naval base construction site into the sea, for the strong rain and wind last weekend. 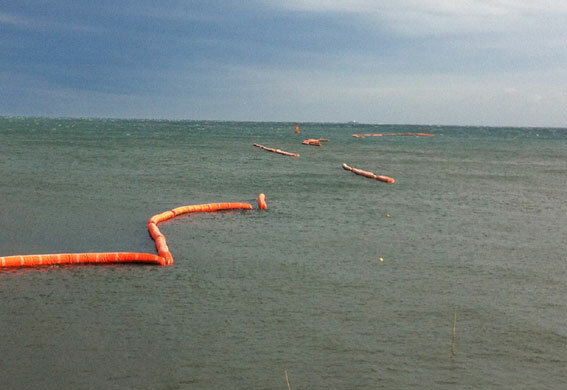 Photo by KFEM/ Headline Jeju, April 8, 2013: Sea water became muddy after the bad weather last weekend. Before and after. 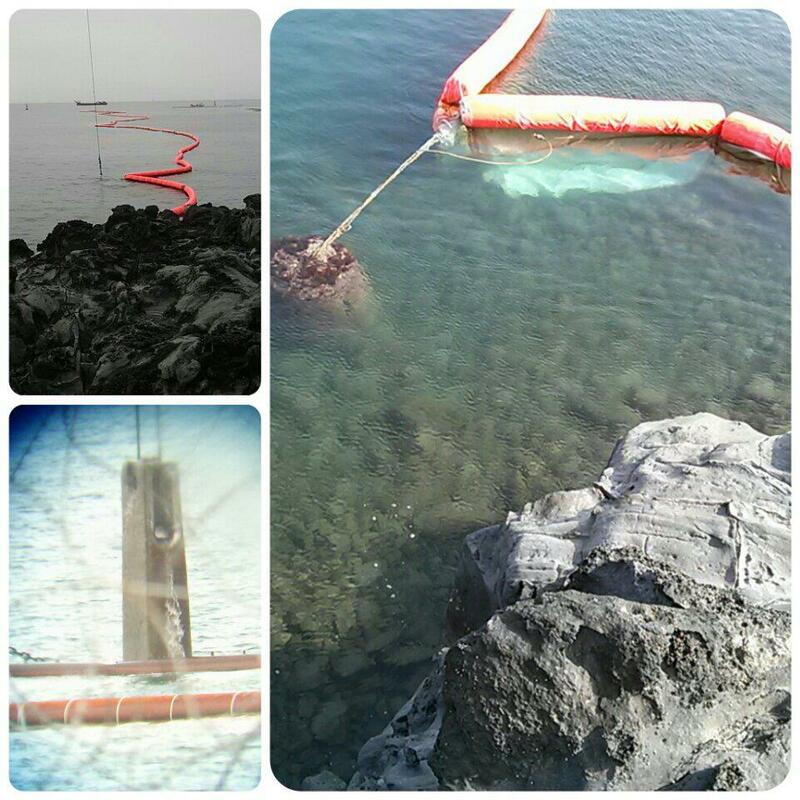 Photo by KFEM/ Headline Jeju, April 8, 2013: Further, the broken silt protectors damaged even in their canvases function nothing, not to mention the sea water that has become muddy. Mr. Bae Gi-Chul, just before the arrest on April 8. The 100 peace bow music had been being played. The police threatening him to arrest under the charge of obstruction of business, finally arrest him. video by Kim Bok-Chul. Don’t cry.. video by Kim Bok Chul on April 8. ‘Take care, friends – thinking of you all… Your courage and persistence in the face of violence, in the struggle for peace, is an inspiration that echoes around the world. Last night Jack and I went to see Arlo Guthrie in concert – celebrating the 100th anniversary of the birth of his late father Woody Guthrie. He invited us to sing the last song with him, loud enough so that it would reach people around the world engaged in struggle.